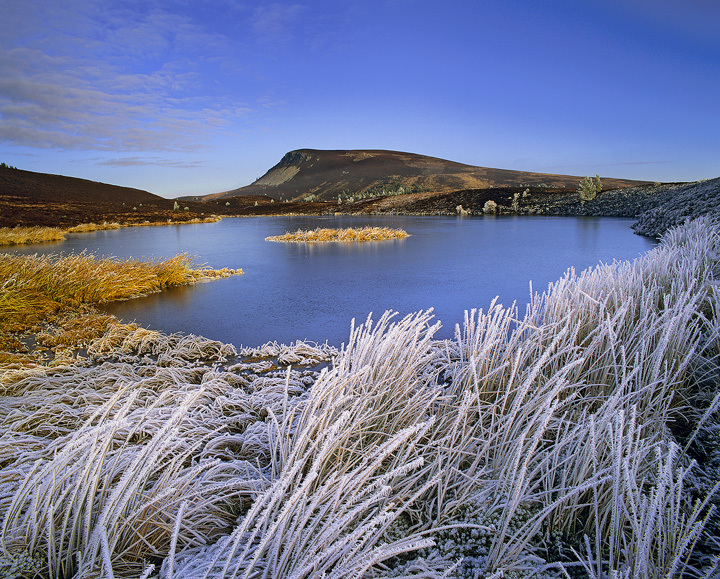 At minus tewnty the loch at the edge of the Dava moor road freezes solid leaving a little golden island of grass trapped in blue ice. At the edges long reeds shaded from the first kiss of sunlight are rigid with a thick coat of hoar frost encrusting every stem. It is a scene of winter perfection for my camera but the ominous noises of the ice expanding from the warmth of direct sunlight are very disconcerting and I jumped clean out of my skin when at last the tension became so great that the massive ice sheet fractured with a huge bang like a shotgun being released next to me.